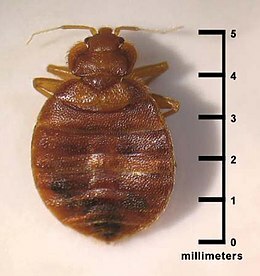 For other uses, see Bed bug (disambiguation). Bed bugs are a type of insect that feed on human blood, usually at night. Their bites can result in a number of health effects including skin rashes, psychological effects and allergic symptoms. Bed bug bites may lead to skin changes ranging from invisible to prominent blisters. Symptoms may take between minutes to days to appear. Itchiness is common, while some may feel tired or have a fever. Typically, uncovered areas of the body are affected and three bites occur in a row. Bed bugs bites are not known to transmit any infectious disease. It was stated in 2012[update] that no truly effective insecticides were available. Insecticides that have historically been found effective include pyrethroids, dichlorvos, and malathion. Resistance to pesticides has increased significantly over time, and harm to health from their use is of concern. The carbamate insecticide propoxur is highly toxic to bed bugs, but it has potential toxicity to children exposed to it, and the US Environmental Protection Agency has been reluctant to approve it for indoor use. Boric acid, occasionally applied as a safe indoor insecticide, is not effective against bed bugs because they do not groom. Bed bug infestations have resurged since the 1980s for reasons that are not clear, but contributing factors may be complacency, increased resistance, bans on pesticides, and increased international travel. The U.S. National Pest Management Association reported a 71% increase in bed bug calls between 2000 and 2005. The number of reported incidents in New York City alone rose from 500 in 2004 to 10,000 in 2009. 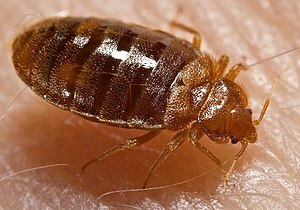 In 2013, Chicago was listed as the number 1 city in the United States with the worst bed bug infestation. As a result, the Chicago City Council passed a bed bug control ordinance to limit their spread. Additionally, bed bugs are reaching places in which they never established before, such as southern South America. Traditional methods of repelling and/or killing bed bugs include the use of plants, fungi, and insects (or their extracts), such as black pepper; black cohosh (Actaea racemosa); Pseudarthria hookeri; Laggera alata (Chinese yángmáo cǎo | 羊毛草); Eucalyptus saligna oil; henna (Lawsonia inermis or camphire); "infused oil of Melolontha vulgaris" (presumably cockchafer); fly agaric (Amanita muscaria); tobacco; "heated oil of Terebinthina" (i.e. true turpentine); wild mint (Mentha arvensis); narrow-leaved pepperwort (Lepidium ruderale); Myrica spp. (e.g. bayberry); Robert geranium (Geranium robertianum); bugbane (Cimicifuga spp. ); "herb and seeds of Cannabis"; "opulus" berries (possibly maple or European cranberrybush); masked hunter bugs (Reduvius personatus), "and many others". ^ a b James, William D.; Berger, Timothy G.; et al. (2006). Andrews' Diseases of the Skin: clinical Dermatology. Saunders Elsevier. p. 446. ISBN 978-0-7216-2921-6. ^ a b c d e f g h i j k l m n o p q r Ibrahim, O; Syed, UM; Tomecki, KJ (March 2017). "Bedbugs: Helping your patient through an infestation". Cleveland Clinic Journal of Medicine. 84 (3): 207–211. doi:10.3949/ccjm.84a.15024. PMID 28322676. ^ a b c d e f g h i j k l m n o p q r Jerome Goddard; Richard deShazo (2009). "Bed bugs (Cimex lectularius) and clinical consequences of their bites". Journal of the American Medical Association. 301 (13): 1358–1366. doi:10.1001/jama.2009.405. PMID 19336711. ^ a b c d e f g h i j k l m n Kolb A, Needham GR, Neyman KM, High WA (2009). "Bedbugs". Dermatol Ther. 22 (4): 347–52. doi:10.1111/j.1529-8019.2009.01246.x. PMID 19580578. ^ a b c d e f g h i j k l m n o p q r s t Doggett SL, Russell R (November 2009). "Bed bugs – What the GP needs to know". Aust Fam Physician. 38 (11): 880–4. PMID 19893834. ^ a b c d e f g h Doggett, SL; Dwyer, DE; Peñas, PF; Russell, RC (January 2012). "Bed bugs: clinical relevance and control options". Clinical Microbiology Reviews. 25 (1): 164–92. doi:10.1128/CMR.05015-11. PMC 3255965. PMID 22232375. ^ a b c d e "Bed Bugs FAQs". Centers for Disease Control and Prevention. 2 May 2017. Retrieved 2 October 2018. ^ a b Hildreth CJ, Burke AE, Glass RM (April 2009). "JAMA patient page. Bed bugs". JAMA. 301 (13): 1398. doi:10.1001/jama.301.13.1398. PMID 19336718. ^ Susan C. Jones (January 2004). "Extension Fact Sheet "Bed Bugs, Injury"" (PDF). Ohio State University. ^ Bircher, Andreas J (2005). "Systemic Immediate Allergic Reactions to Arthropod Stings and Bites". Dermatology. 210 (2): 119–127. doi:10.1159/000082567. PMID 15724094. ^ "How to Manage Pests Pests of Homes, Structures, People, and Pets". UC IPM Online (Statewide Integrated Pest Management Program, UC Davis). Retrieved 26 June 2010. ^ Xavier Bonnefoy; Helge Kampen; Kevin Sweeney. "Public Health Significance of Urban Pests" (PDF). World Health Organization. p. 136. Retrieved 1 December 2016. ^ Shukla; Upadhyaya (2009). Economic Zoology (Fourth ed.). Rastogi. p. 73. ISBN 978-81-7133-876-4. ^ a b c d Quarles, William (March 2007). "Bed Bugs Bounce Back" (PDF). IPM Practitioner. 24 (3/4): 1–8. Retrieved 27 May 2010. ^ Anderson, J. F.; Ferrandino, F. J.; McKnight, S.; Nolen, J.; Miller, J. (2009). "A carbon dioxide, heat and chemical lure trap for the bed bug, Cimex lectularius" (PDF). Medical and Veterinary Entomology. 23 (2): 99–105. doi:10.1111/j.1365-2915.2008.00790.x. PMID 19499616. Archived (PDF) from the original on 16 August 2017. Retrieved 27 May 2010. ^ Singh, Narinderpal; Wang, Changlu; Cooper, Richard; Liu, Chaofeng (2012). "Interactions among Carbon Dioxide, Heat, and Chemical Lures in Attracting the Bed Bug, Cimex lectularius L. (Hemiptera: Cimicidae)". Psyche. 2012: 1–9. doi:10.1155/2012/273613. ^ Wang, Changlu; Gibb, Timothy; Bennett, Gary W.; McKnight, Susan (August 2009). "Bed bug (Heteroptera: Cimicidae) attraction to pitfall traps baited with carbon dioxide, heat, and chemical lure" (PDF). Journal of Economic Entomology. 102 (4): 1580–5. doi:10.1603/029.102.0423. 102(4):1580-5. ^ Reis Matthew D., Miller Dini M. (2011). "Host Searching and Aggregation Activity of Recently Fed and Unfed Bed Bugs (Cimex Lectularius L.)". Insects. 2 (4): 186–94. doi:10.3390/insects2020186. PMC 4553457. PMID 26467621. ^ Margie Pfiester; Philip G. Koehler; Roberto M. Pereira (2009). "Effect of Population Structure and Size on Aggregation Behavior Of(Hemiptera: Cimicidae)". Journal of Medical Entomology. 46 (5): 1015–020. doi:10.1603/033.046.0506. ^ Potter, Michael F. "BED BUGS". University of Kentucky College of Agriculture. Archived from the original on 2 July 2010. Retrieved 27 June 2010. ^ a b Steelman, C.D. 2000. Biology and control of bed bugsArchive, Cimex lectularius, in poultry houses. Avian Advice 2: 10,15. ^ "The Truth About Bedbugs: Debunking the Myths". PAWS SF. Archived from the original on 2013-10-14. Retrieved 13 Oct 2013. ^ Susan L. Woodward; Joyce A. Quinn (30 September 2011). Encyclopedia of Invasive Species: From Africanized Honey Bees to Zebra Mussels: From Africanized Honey Bees to Zebra Mussels. ABC-CLIO. p. 124. ISBN 978-0-313-38221-5. Retrieved 15 August 2013. ^ Anderson, AL; Leffler, K (May 2008). "Bedbug infestations in the news: a picture of an emerging public health problem in the United States" (PDF). Journal of Environmental Health. 70 (9): 24–7, 52–3. PMID 18517150. Archived from the original (PDF) on 26 April 2012. ^ "7 On Your Side: Get rid of bed bugs for less than $15". Retrieved 1 December 2016. ^ "Detecting Bed Bugs Using Bed Bug Monitors (from Rutgers NJAES)". Retrieved 1 December 2016. ^ a b Kate Wong (23 January 2012). "Bed Bug Confidential: An Expert Explains How to Defend against the Dreaded Pests". Scientific American. Retrieved 19 August 2018. ^ Sherwood, Harriet (19 August 2018). "Bedbugs plague hits British cities". The Observer. Retrieved 19 August 2018. ^ "Using Steamers to Control Bed Bugs". 2016-06-22. ^ Hulasare, Raj. "Fundamental Research on the Efficacy of Heat on Bed Bugs and Heat Transfer in Mattresses". ^ York Times. In Search of a Bedbug Solution. Published: 4 September 2010. ^ "Got Bed Bugs? Don't Panic!" (PDF). Retrieved 27 August 2018. ^ Miller, Dini (11 August 2008). "Bed bugs (hemiptera: cimicidae: Cimex spp.)". In John L. Capinera. Encyclopedia of Entomology. Springer Science & Business Media. p. 414. ISBN 978-1-4020-6242-1. ^ a b Heukelbach, J; Hengge, UR (2009). "Bed bugs, leeches and hookworm larvae in the skin". Clinics in Dermatology. 27 (3): 285–90. doi:10.1016/j.clindermatol.2008.10.008. PMID 19362691. ^ Owen, James (13 May 2004). "Bloodthirsty Bedbugs Stage Comeback in U.S., Europe". National Geographic News. National Geographic. Retrieved 31 May 2010. ^ Romero A, Potter MF, Potter DA, Haynes KF (2007). "Insecticide Resistance in the Bed Bug: A Factor in the Pest's Sudden Resurgence?". Journal of Medical Entomology. 44 (2): 175–178. doi:10.1603/0022-2585(2007)44[175:IRITBB]2.0.CO;2. ISSN 0022-2585. PMID 17427684. ^ Bankhead, Charles (27 August 2015). "Bed Bug Resurgence a Multifactorial Issue: Hygiene, insecticide bans, globalization all contribute". Meeting Coverage. MedPage Today. Archived from the original on 28 August 2015. Retrieved 28 August 2015. ^ a b Krause-Parello CA, Sciscione P (April 2009). "Bedbugs: an equal opportunist and cosmopolitan creature". J Sch Nurs. 25 (2): 126–32. doi:10.1177/1059840509331438. PMID 19233933. ^ Xavier Bonnefoy; Helge Kampen; Kevin Sweeney. "Public Health Significance of Urban Pests" (PDF). World Health Organization. p. 131. Retrieved 1 December 2016. ^ Cranshaw, W.S. ; Camper, M.; Peairs, F.B. (Feb 2009). "Bat Bugs and Bed Bugs". Colorado State University Extension. Retrieved 27 May 2010. ^ Coughlan, Sean (29 January 2014). "Catching the mother of all bed bugs". BBC News. BBC. Retrieved 29 January 2014. ^ a b Newsweek (8 September 2010). "The Politics of Bedbugs". Archived from the original on 21 October 2010. Retrieved 28 October 2010. ^ Voiland, Adam (16 July 2007). "You May not be Alone". U.S. News & World Report. 143 (2): 53–54. Archived from the original on 7 November 2011. ^ Megan Gibson (19 August 2010). "Are Bedbugs Taking Over New York City?". Time Magazine. ^ Metropolitan Tenants Organization (16 July 2013). "Chicago Council passes Bed Bug Ordinance". Metropolitan Tenants Organization website. ^ Faúndez E. I., Carvajal M. A. (2014). "Bed bugs are back and also arriving is the southernmost record of Cimex lectularius (Heteroptera: Cimicidae) in South America". Journal of Medical Entomology. 51 (5): 1073–1076. doi:10.1603/me13206. ^ Faúndez E. I. (2015). "Primeros registros de la chinche de cama Cimex lectularius Linneo, 1755 (Hemiptera: Cimicidae) en la Isla Tierra del Fuego (Chile)". Arquivos Entomolóxicos. 14: 279–280. ^ a b Mullen, Gary R.; Durden, Lance A. (8 May 2009). Medical and Veterinary Entomology (Second ed.). Academic Press. p. 80. ISBN 978-0-12-372500-4. ^ Smith, William (1847). A dictionary of Greek and Roman antiquities – Sir William Smith – Google Boeken. Retrieved 11 November 2013. ^ John Southall. "That soon after the Fire of London, in some of the new-built Houses they were observ'd to appear, and were never noted to have been seen in the old, tho' they were then so few, as to be little taken notice of; yet as they were only seen in Firr-Timber, 'twas conjectured they were then first brought to England in them; of which most of the new Houses were partly built, instead of the good Oak destroy'd in the old". A Treatise of Buggs [sic], pp. 16–17. Retrieved 1 December 2016. ^ Schaefer, C.W. ; Pazzini, A.R. (28 July 2000). Heteroptera of Economic Importance. Boca Raton, FL: CRC Press. p. 525. ISBN 978-0-8493-0695-2. ^ Kambu, Kabangu; Di Phanzu, N.; Coune, Claude; Wauters, Jean-Noël; Angenot, Luc (1982). "Contribution à l'étude des propriétés insecticides et chimiques d'Eucalyptus saligna du Zaïre (Contribution to the study of insecticide and chemical properties of Eucalyptus saligna from Zaire ( Congo))". Plantes Médicinales et Phytothérapie. 16 (1): 34–38. hdl:2268/14438. ^ "Getting Rid of Bed-Bugs". Grubstreet.rictornorton.co.uk. Retrieved 11 November 2013. ^ "Icones Cimicum descriptionibus illustratae". Retrieved 11 November 2013. ^ "Peat and peat mosses". Scientific American. 3 (39): 307. 17 June 1848. doi:10.1038/scientificamerican06171848-307b. ^ Hill, Stuart B. (May 1986). "Diatomaceous Earth: A Non Toxic Pesticide". Macdonald J. 47 (2): 14–42. Archived from the original on 26 May 2010. Retrieved 26 May 2010. ^ Michael F. Potter; Kenneth F. Haynes; Chris Christensen; T. J. Neary; Chris Turner; Lawrence Washburn; Melody Washburn (December 2013). "Diatomaceous Earth: Where Do Bed Bugs Stand When the Dust Settles?". PCT Magazine (12): 72. ISSN 0730-7608. ^ Michael F. Potter; Kenneth F. Haynes; Jennifer R. Gordon; Larry Washburn; Melody Washburn; Travis Hardin (August 2014). "Silica Gel: A Better Bed Bug Desiccant". PCT Magazine (8): 76. ISSN 0730-7608. ^ Boase, C. (2001). "Bedbugs – back from the brink". Pesticide Outlook. 12 (4): 159–162. doi:10.1039/b106301b. Retrieved 27 May 2010. ^ Szyndler, M.W. 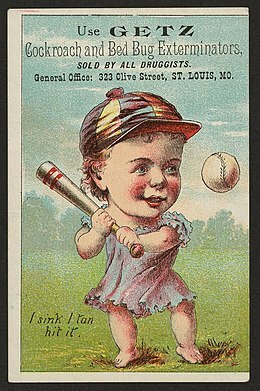 ; Haynes, K.F. ; Potter, M.F. ; Corn, R.M. ; Loudon, C. (2013). "Entrapment of bed bugs by leaf trichomes inspires microfabrication of biomimetic surfaces" (PDF). Journal of the Royal Society Interface. 10 (83): 20130174. doi:10.1098/rsif.2013.0174. ISSN 1742-5662. PMC 3645427. PMID 23576783. ^ a b Boase, Clive J. (April 2004). "Bed-bugs – reclaiming our cities". Biologist. 51: 1–4. Retrieved 2010-06-07. ^ a b Potter, Michael F. (2011). "The History of Bed Bug Management – With Lessons from the Past" (PDF). American Entomologist. 57: 14–25. doi:10.1093/ae/57.1.14. ^ a b c Gerberg, Eugene J. (16 November 2008). "Entomologists in World War II" (PDF). Proceedings of the DOD Symposium, 'Evolution of Military Medical Entomology', Held 16 November 2008, Reno, NV. Annual Meeting of the Entomological Society of America. Retrieved 11 November 2013. ^ Scarupa, M.D. ; Economides, A. (2006). "Bedbug bites masquerading as urticaria". Journal of Allergy and Clinical Immunology. 117 (6): 1508–1509. doi:10.1016/j.jaci.2006.03.034. PMID 16751024. ^ Kimberly Stevens (2003-12-25). "Sleeping with the Enemy". New York Times. Retrieved 2010-01-16. ^ Marshall Sella (2010-05-02). "Bedbugs in the Duvet: An infestation on the Upper East Side". New York Magazine. Retrieved 2010-06-11. ^ Berg, Rebecca (2010). "Bed Bugs: The Pesticide Dilemma". Journal of Environmental Health. 72 (10): 32–35. PMID 20556941. ^ Stephen L Doggett; Dominic E. Dwyer; Richard C Russell (January 2012). "Bed Bugs ClinicalRelevance and Control Options". Clinical Microbiology Reviews. 25 (1): 164–92. doi:10.1128/CMR.05015-11. PMC 3255965. PMID 22232375. A Code of Practice for the Control of Bed Bugs in Australia, ICPMR & AEPMA, Sydney Australia, September 2011. ISBN 1-74080-135-0. "Bed Bug Home Page". Bedbug.org.au. 14 October 2005. Retrieved 11 November 2013.